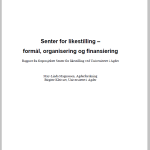 In the spring of 2007, Agder University College (now the University of Agder) was advised by the Agder Council’s Equality Committee to establish a ‘competence forum’ in cooperation with Agder Research. The forum was intended as an arena for interaction between researchers working with gender and equality and practitioners ‘in the field’, with its main purpose being to contribute to research-based knowledge and increased coordination between different types of equality projects as a foundation for regional work on gender and equality. A project group was established with representatives from Agder Research, Agderrådet, Vest and East Agder county councils and KS Agder. The members of the project group agreed early in the process that establishing a centre for gender and equality would be the most adequate response to the need voiced by the regional community for gathering and strengthening the professional environment. From this perspective a competence forum was one of the activities or arenas that can be operated by a centre. In June 2007 the Board of the University College adopted a preliminary project titled Centre for Gender and Equality. The mandate of the preliminary project was to define the centre’s main objectives as well as to propose a model for organization and funding. The preliminary project was financed by HiA/UiA, the county councils, Kristiansand Municipality, the university’s gender and equality programme and Agder Research. In February 2008 the University Board decided to establish a centre for gender and equality as a 4-year project. An interim board was established and a process for recruiting a manager of the centre was implemented. Since research and coordination of R&D projects is one of the main goals of the centre, it was decided to look for a leader with professorial competence. In the autumn of 2009 Professor Ulla-Britt Lilleaas became the first leader of the centre, filling the position until medio 2011 when Senior Adviser Åsta L Einstabland was appointed acting leader. At the end of the project period in 2012 the centre was established as a permanent centre at the University of Agder. The Board was dissolved, and the centre today has 2 permanent members of staff. In addition, one researcher from Agder Research is affiliated with the centre as a consultant and several researchers from the University of Agder are also affiliated with the centre. Other kinds of competence are hired in according to needs. The composition of the staff makes it natural for the centre to focus on both research and teaching/dissemination. The report from the preliminary project can be downloaded by clicking on the picture below.